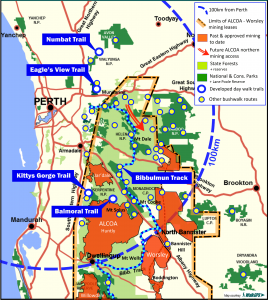 Mining leases cover a majority of forested walk areas close to Perth, outside of the national parks. Through their bushwalking activities across much of the state forests and reserves over the past half century, bushwalkers have a unique insight into the impacts that bauxite mining and minesite rehabilitation are having on the forests and landscapes of the Darling Range near Perth. Mining is today expanding across the leases at an unprecedented rate and is expected to continue for another 50 years. 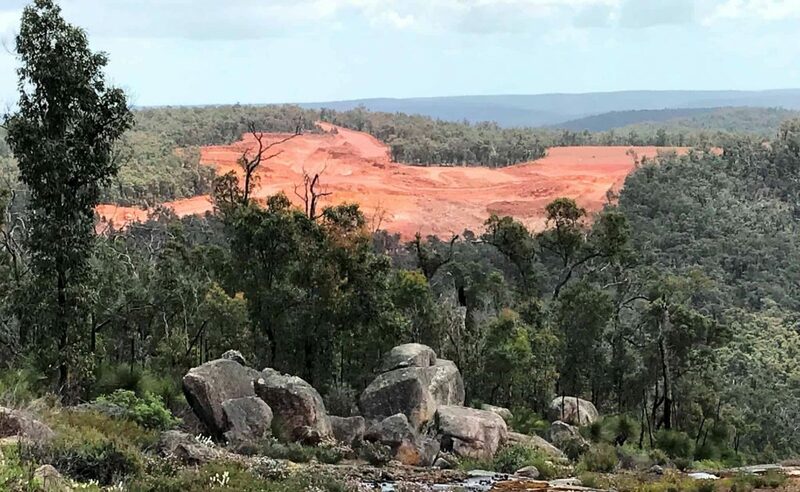 At least 60,000 ha (600 sq km) of mature forest will have been cleared and more than 60% of the northern jarrah forest and wandoo woodlands close to Perth will have been directly impacted or fragmented by mining, greatly reducing quality bushwalking opportunities in the region. Most bushwalkers value walking in high quality, undisturbed natural or near-natural environments which the extensive rehabilitated sites cannot provide. As Perth’s population grows in coming years the demands will increase for access to recreational bushwalking in natural undisturbed environments near the city. Meanwhile long-popular, traditional bushwalking areas lost to bauxite mining will extend from Lane Poole Reserve in the south (see map), across Mount Solus area and Bannister Hill, to beyond Mount Dale in the north. The impacts of the mining, especially its environmental and social aftermath, are largely ignored. WA’s Forest Management Plan 2014-2023 (‘FMP’) is failing to adequately consider and protect healthy recreational opportunities such as bushwalking close to the Perth metropolitan area. The parallel operation of the State Agreements with the miners and WA’s Environmental Protection Act, results in conflicting and contradictory priorities and decisions with regard to the goals of conservation and sustainable social opportunities, including for recreation. BWA continues to encourage greater awareness of the implications of the mining for local bushwalking. We will seek greater transparency and consultation from the State Government and the miners, in the hope that adverse impacts on existing walk areas near Perth will be acknowledged and mitigated. Extension of Regional Forest Agreement with the Commonwealth, Joint submission (BWA-Outdoors WA-WA Rogaining Assocn.) to DBCA – Conservation and Ecosystem Management, Nov. 2018. Draft Performance Review of WA Forest Management Plan 2014-2023, BWA Submission to Conservation and Parks Commission, Oct. 2018. Commonwealth Senate inquiry into mining rehabilitation, BWA submission, Mar. 2018.